We are giving our users the ability to personalize their workspaces even further with a number of enhancements in April '19. All personalizations in Business Central continue to roam with the user, no matter which device or browser they work on. One size does not fit all. Users can make minor adjustments the layout of their actions on any list, worksheet, card or document page to optimize for precisely how they work. Hide away any actions that are not relevant to your tasks, role or department. Move actions across groups and hide or re-order groups. 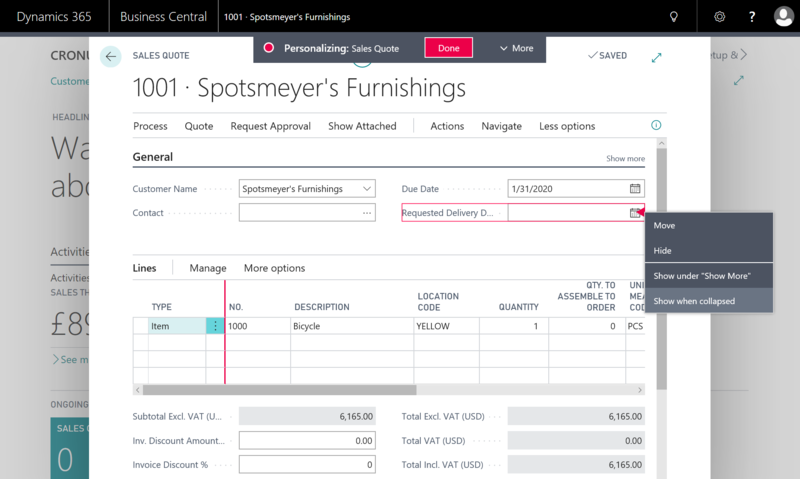 Subtle visual indicators guide users to what is possible with the April '19 release of Business Central. Quick Entry is a productivity feature for desktop users that accelerates repetitive entry of records. When Enter is pressed on a field, the focus moves to the next editable Quick Entry field, skipping over other fields that are auto-filled or occasionally specified. On any page, users can personalize how fields behave and optimize for how they or their department typically works when entering records. Simply use the personalization menu to include or exclude fields in Quick Entry. Some fields are needed only occasionally, while others are so important that business users need them visible at all times. Fields on card and document pages can now be personalized to adjust whether they are hidden until choosing Show more or are displayed in the FastTab summary when the FastTab is collapsed. Combined with the ability to move, hide, and show fields, this provides maximum flexibility to optimize each page for readability. Clicking a field in a FastTab summary will conveniently expand the FastTab and focus on that field. Available shortly after the April '19 update, users will be able to edit, save and personalize list views. Saving your filters on any list is a great productivity feature that reduces the need for re-typing common or complex filters. Business Central gives you even more control over your lists: personalize each view independently by adjusting column layout and column sorting to create the perfect overview of your data. Optimize the filter pane on any list by choosing which views can be removed or hidden, and drag an important view to display it at the top of the pane for convenient access. Coming later this year after the April '19 update to Business Central, users will have full control over their links in the navigation bar. By pinning any list to the navigation bar, users can quickly navigate to often-visited collections of records to begin their business tasks without having to search for that list each time. Modifications directly on the navigation bar also include dragging links to re-order them, hiding links that are not relevant, and regrouping links.